Editor’s Note: Many may wonder why this article has a place on my blog about Love. The answer is that many repeating patterns are found in our world and in our Universe giving us clues to identify questions we may have about ourselves. The number of 144000 has long been a significant number in Earth’s history (at least what we know of it!). When originally constructed in ancient times the surface of The Great Pyramid of Giza was covered in highly polished Tura limestone blocks. Carefully interlocked the blocks gave a uniform smooth surface to all 4 sides. As a result the whole structure shone brilliant white in the light of the reflected sun. 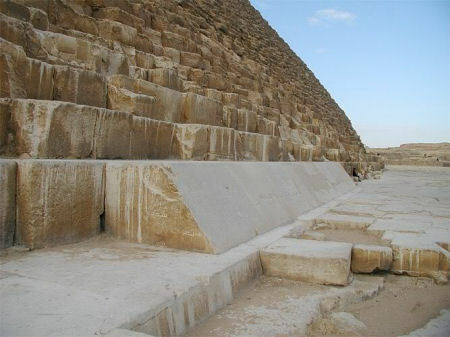 Now more recently, in 1300 AD, a great earthquake struck the Giza region loosening the outer casing stones, causing many of them to fall off about the base. And this enabled one Bahri Sultan An-Nasir Nasir-ad-Din al-Hasan at the time to salvage them for various building projects in nearby Cairo; including the construction of Mosques and fortresses. Based upon what few remaining casing stones have survived, it has been possible to reconstruct the pattern as encompassed the pyramid in its original state, to determine what would have been the total number of casing stones as once covered the structure. The number is question is 144000. The value here is almost exactly 14400, which is indeed 144000 divided by 10. Now in terms of evaluating the strength of the relationship, one may note that the level of error is very small indeed. Only a minor repositioning of the structure or slight alternation to the surveyed base side length of the pyramid would generate a perfect 14400 / 1 ratio. In light of this association then, the chosen number of casing stones appears to have been set at 10 times the value of the ratio between the latitude arc of The Great Pyramid and its base side length. In the book of Revelation (Apocalypse) the servant of God John is given a series of visions of the earth being subject to extreme devastation in some far off future age. An ancient calendar stretching back thousands of years, the Long Count was developed by the Maya to track extremely long periods of time. In order, the names of the primary units and their duration are given in the image to the left. One can see then that the largest cycle of the Long Count is the Baktun at precisely 144000 days, equal to approximately 394.25 years. Between the planets Mars and Jupiter there is a debris field of rock commonly known as the asteroid belt; a widely dispersed field populated by objects ranging in size from several hundred miles in diameter down to dust. One object however stands out as being far greater in size than all others: Ceres. Unlike the other larger fragments of rock that compose the asteroid belt, Ceres is itself classed as a dwarf planet. And this is due to the fact that it is a true spheroid in shape – not merely a jagged edge piece of rock. Moreover, Ceres alone comprises 25% of the total mass of the asteroid belt. It is indeed the largest single object within the field, with an orbital period of some 1680.089 days. The proof as detailed in my book is very decisive in demonstrating a connection between the numeric sequence of 144 and an actual astronomical body. Carefully examined, one can find this ratio in nature governing the very unfolding of life itself, generating a spiral pattern governing the very development of the growth of certain creatures. As part of the numeric sequence one can see the presence of the key value 144 as part of the generation of the Golden Proportion. In many areas then the numeric value of 144 can be found. It is linked not just to ancient megalithic structures such as The Great Pyramid in terms of its latitude positioning and casing stones. But variations are also found in astronomical cycles, ancient calendar systems, Biblical prophecy, and even the very unfolding of life. It is a number of great occult significance.